Are you a rocketeer under age 18, member of the NAR or not? Check out our new NARTREK Cadet Program designed especially for you! NARTREK stands for “National Association of Rocketry Training Rocketeers for Experience and Knowledge.” It consists of a series of achievement levels in rocketry, each requiring more skill to complete than the previous one. As each level is finished, you receive an Achievement Certificate and a jacket patch certifying your accomplishment. You are under no time limit. You progress at your own pace. 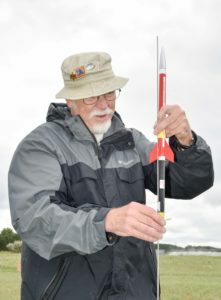 NARTREK is a self-paced program designed to improve your knowledge and skill in rocketry step-by-step. NARTREK is for all modelers—young and old! NARTREK operates on the honor system. NARTREK is administered by a staff of experienced volunteers who work with you by email to help solve your problems. NARTREK uses commercially-available rocket kits whenever possible. NARTREK uses existing publications and books available from NAR Technical Services, manufacturers, and other easily available sources. NARTREK is designed to be low-cost to you. NAR makes no profit from the NARTREK program. You buy your own kits, motors, equipment, and publications. NARTREK is a program designed for you, with patches and certificates for each achievement level and recognition of your progress. When you complete the entire NARTREK program, you will be capable of designing, building, and safely flying nearly every type of rocket. You will be ready to progress into the most advanced areas of rocketry—national and international competition, advanced technical research, and more. To participate, you must meet the basic NARTREK program requirements. Fill out the application form and mail it to NARTREK along with your entry fee—or, take advantage of our introductory web-based “try it before you buy it” program. Your program packet for the first (Bronze) level will contain details of each requirement, a list of recommended materials and publications to help you complete this level, and certification forms for each requirement. At your own pace, complete each requirement. If you run into problems, contact NARTREK Base, who will put you in contact with someone who can help. As you complete each requirement, fill out the certification form. When you have completed all the certification forms for your current level, mail them in to NARTREK Base. NARTREK Base will evaluate your certifications and send back your Achievement Certificate, along with the appropriate jacket patch. If you have signed up for additional program levels, the next packet will be sent to you automatically. You may sign up for additional levels at any time. Perform a 60-second parachute duration flight with a kit model. Perform a 30-second streamer duration flight with a kit model. Perform a two-staged flight with a kit model. Perform a large model flight (D motor or above) with a kit model. Upon completing these requirements you move to the next level: Silver. No Pressure Remember: once you start a NARTREK Achievement Level, you don’t have to complete it within any time limit. In fact, you don’t ever have to complete it at all! NARTREK is designed to increase your enjoyment of rocketry, not your stress level. So don’t “work” at it—have fun! You must be a member of the National Association of Rocketry. 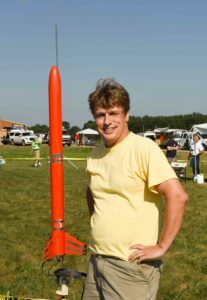 You must have built and flown at least one single-stage rocket using a kit. You must have your own launching equipment. Your NAR Section may use a rack launch system, but it is important that you understand the fundamentals of the ignition and launching of sport rockets. This equipment is inexpensive and will last you for many years. 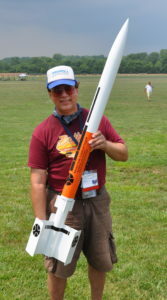 You must know and abide by the NAR Model Rocket and High Power Safety Codes. All NARTREK activities are based upon the NAR Safety Codes. You must understand the NAR rocket motor coding system. To take advantage of our web-based “try it before you buy it” offer, download the NARTREK Bronze level packet now, and follow the instructions on the first page. Preview the Silver Level Packet. Preview the Gold Level Packet. The by-mail fee for the Bronze and Silver achievement level packet is $5. The Gold level is $10. Special Offer: receive the Bronze, Silver, and Gold packets, plus one advanced level of your choice, for $20. As soon as your check arrives, your Bronze packet will be in the mail to you. Join NARTREK now, and wear the NARTREK Gold!